Shooter at Mother Earth Spirits, Downtown Kinston. Photo by Jessica Braxton. “Let us be-gin,” a phrase you may recognize if you’ve ever visited Mother Earth Spirits in downtown Kinston. These three words are emblazoned on a large canvas welcoming visitors to the distillery. 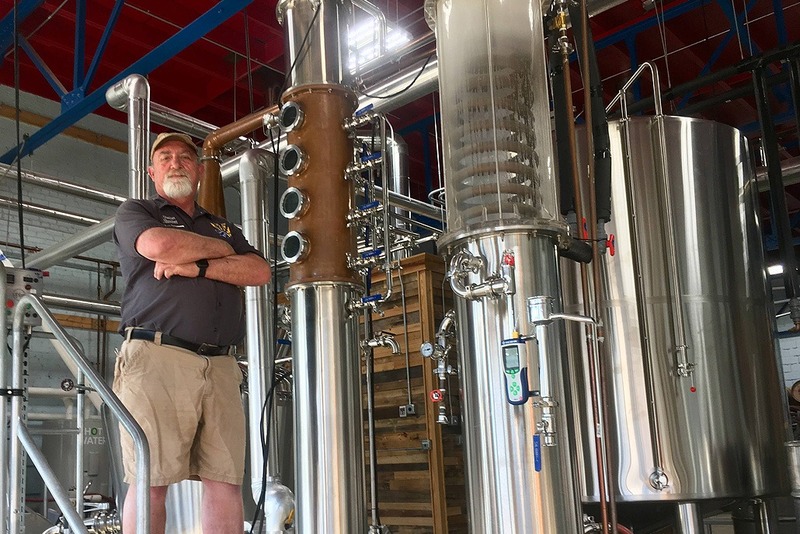 Kevin Graham, better known as “Shooter,” is the Head Distiller at Mother Earth Spirits, a position he’s held since October of 2014 when the first bottle of gin poured from the still. Originally from California, Shooter relocated to North Carolina prior to working at Mother Earth. Starting out as a home brewer, his passion led him to the soon to be famous brewery where he worked in all facets of beer production before taking on other roles. Over the years, Shooter has made many significant contributions to Mother Earth. He started the brewery tour program, built the souvenir store that is currently located at the brewery and developed the first gin recipe. In January of 2013, Steven Hill was working to bring the idea of creating a craft distillery to life and was searching for the right person to take the lead. Shooter was instrumental in developing the first recipes and production. Originally located in the same building as the brewery, consumer demand for the distillery’s products increased rapidly and they soon outgrew the small space. In early 2017, Mother Earth Spirits purchased more equipment and the building they are now operating in at 302 Mitchell Street in downtown Kinston. Mother Earth Spirits Gin is unlike many other gins. It has a lower juniper and pine tree flavor opting for a more citrus finish. Shooter uses orange and lemon peel to get the award-winning citrus finish that the gin is known for. Since the 2014 release of gin and whiskey, Mother Earth Spirits has earned a total of 10 medals in national competitions. Although currently available only in North Carolina, Mother Earth Spirits is looking forward to shipping gin to other markets in the near future. Demand has continued to grow and the company recently purchased more new equipment to increase production. Mother Earth Spirits is also producing a single malt American whiskey. The whiskey is aged in charred White American Oak barrels for at least 24 months. Each batch is hand bottled and numbered, and features notes of caramel, fresh leather and toasted oak. The whiskey is already very popular, and was recently named Best Whiskey in North Carolina! Shooter is still harvesting whiskey from the old location and it is currently in and out of stock due to the small production abilities from 2 years ago. However, by the end of this year, the whiskey will be properly aged and on the market without any further interruption. Mother Earth Spirits works hard to provide the highest quality product. Distilling is different than making new brews. “It’s not harder, it’s different. It involves more chemistry than just allowing something to ferment and creating a beer,” says Shooter. “We ferment the wash similar to the beer process but then we extract all the alcohol and flavor discarding the rest, so we have to go through more processes to create the product,” he said. In addition to creating award-winning gin and whiskey, Shooter’s other passions include fly fishing in the mountains, building and flying remote-controlled aircraft, and playing and listening to jazz, country and rock music. Shooter has always enjoyed music and playing musical instruments—drums, guitar, violin, banjo and bass. He even played once with the members of the Nitty Gritty Dirt Band in the 80s. Want more important local news like this? Please subscribe to get future editions of our newsletter, “The Edge.” Stuff you need to know, delivered once a month. No SPAM, no bull, unsubscribe at any time. Sign up at http://eepurl.com/gdjrIj.